What sets the SGA-40 apart is the fact it is designed with European market in mind and offers an affordable, ultra reliable and highly efficient amplifier. It is fitted with four inputs two on the rear and two on the front panel. Requiring only a 35mm depth the SGA-40 fits a standard UK and European single back box whilst still leaving plenty of room for connections making it easy to install and use. 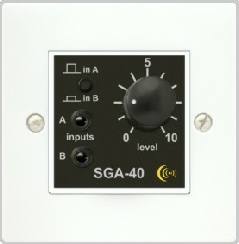 For further convenience the SGA-40 can be fitted to the iKON range of access modules. The SGA-40 is a cost effective, ultra-reliable and energy efficient, 20 watt per channel stereo wall and dado mounting amplifier. It comes in the 50mm Euro format and is supplied with a UK size mounting frames available in a wide range of finishes. This makes the SGA-40 ideal for multi-room audio, classroom, hotel bedroom and small meeting room applications. The SGA-40 is manufactured in the UK to the 50mm euro format and supplied complete with a UK size white mounting frame. Alternative frames are available in a wide range of finishes from iKON AVS as well as multiple switch plate manufacturers. The SGA-40 fits a standard UK single back box and requires only a 35mm depth. The SGA-40 uses an 86% efficient class D design and has a RMS* output of 20 watts per channel into 8 Ohms when powered from an 15V power supply or 10 watts when powered by the included 12V power supply, and as most quality loudspeakers are 8 Ohms, maximum efficiency is assured. Additionally the amplifier adopts an ultra low power standby state when no signal is present. It is fitted with two rear inputs on screw terminals for permanent connections and two 3.5mm stereo jacks on the front panel for other sources making the SGA-40 easy to install & use. What sets the SGA-40 apart is the fact it is designed with European market in mind and offers an ultra reliable and affordable amplifier.